The District Nurses Community Clinic is available to all members of the community treating minor illness and general health needs. Bulk billing is available to pension or health care card holders, and no referral is required. For a clinic appointment please call (03) 6208 0551. Operates Tuesday and Thursday. Fee for Service applies. Staffed by qualified foot care Registered Nurses. 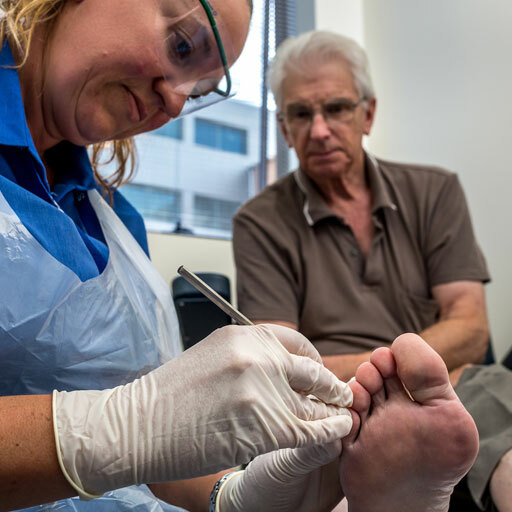 Clients receive basic foot care and where necessary can be referred on to a podiatrist or GP. All categories of wounds attended by Registered Nurses. Communication maintained with the GP regarding changing client needs. Clients with complex wounds will be referred for Nurse Practitioner review and specialist wound review if needed. Immunisations administered by qualified Nurse Immunisers. Provision of all immunisations on the National Immunisation Register to children and adults. A Nurse Practitioner and Registered Nurse are available Monday to Friday to provide comprehensive, client-centred care to people of all ages in the community at our clinic. Home visits can be arranged by appointment. The clinic focuses on minor injury and illness as well as enhanced health promotion, disease prevention, chronic disease management and care coordination. A Nurse Practitioner will work with a multidisciplinary team and collaborate with specialists and GPs to improve access to specialist care.